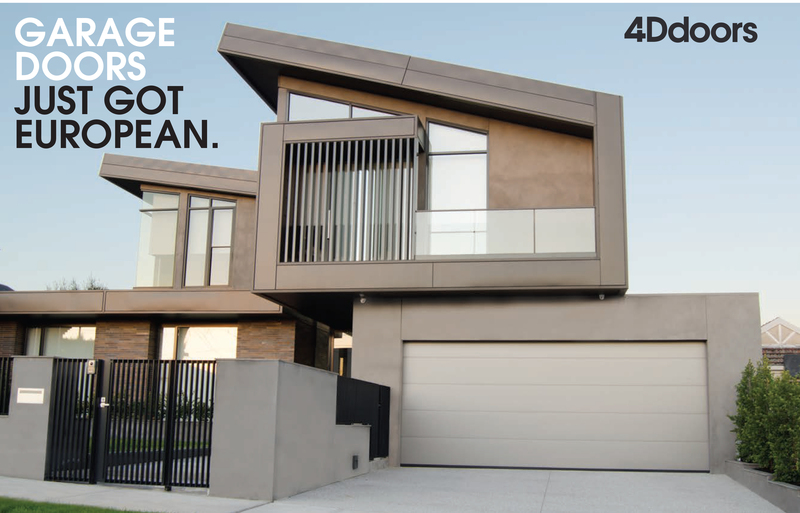 If you are a consumer under the Australian Consumer Law, 4D Doors will provide you, the original purchaser, with this limited warranty in addition to any rights that you have under Australian consumer protection laws. This warranty is in addition to, and does not exclude, restrict or modify your guarantees and other legal rights under Australian Consumer law. Our goods come with guarantees that cannot be excluded under the Australian Consumer Law. You are entitled to a replacement or refund for a major failure and compensation for any other reasonably foreseeable loss or damage. You are also entitled to have the goods repaired or replaced if the goods fail to be of acceptable quality and the failure does not amount to a major failure. This warranty only applies to products sold by 4D Doors or an approved and authorised dealer in the country of purchase. An approved and authorised dealer meaning an approved reseller of 4D Doors’ products purchased from 4D Doors for the purpose of supplying those products to the end consumer. This warranty document is not intended to create a contract between 4D Doors and the purchaser. Installation is covered for a period of twelve months from the date of installation in cases where the products have been installed by 4D Doors. This warranty does not extend to installations by approved and authorised dealers. Products in normal residential and industrial/commercial use are covered by a twelve-month warranty or number of cycles, whichever comes first (or as per the table in this document). The number of cycles refers to one opening and closing cycle. Proof of purchase, including the original invoice must be presented. Products are serviced by a professional as authorised by 4D Doors at regular intervals, the cost of which is not covered by the product warranty. The product(s) are well maintained and kept in good working condition. The supplier must be notified as soon as reasonably practicable of any defect. If the 4D Doors product was supplied by an authorised 4D Doors dealer and this dealer cannot be contacted, then notification must be as soon as reasonably practicable made to 4D Doors of the failure as per the conditions of this warranty. The purchaser is responsible for the cost of making a claim under this warranty. Damage or defects to surface coatings must be clearly visible from a distance of three (3) metres from the product, and may be touched up using touch up paint as deemed fit by 4D Doors. The warranty period is calculated from the date of purchase for products not requiring installation, and will be calculated from the time of installation for products installed. Any goods repaired or replaced during the warranty period will be covered by the terms of this warranty until the expiration of the original warranty period or number of cycles (whichever occurs first). Modifications: 4D Doors will not be required to incorporate any modifications made to existing or future models. Higher Frequency use: Components will experience higher levels of wear in applications such as multi car park entrance products for example. This will reduce the warranty period accordingly. Springs: Balance and tension in the springs will require adjustment, and this is not included in the warranty. Springs must be regularly adjusted and maintained, and will be at the cost of the purchaser. Timber Looking finishes: These are designed to imitate the look of natural timber and will have variation in the look and finish. This is not considered a defect and is not covered under this warranty. Travel Expenses: Expenses incurred by 4D Doors or its authorised dealer in travelling and or transporting products to and from the location of the product are not included and will be paid for by the purchaser. Additional access or equipment required: Expenses incurred by 4D Doors or its authorised dealer required to provide clear access, or the equipment used to access the product (for example: Lifting hardware such as forklift or scissor lift) are not covered by this warranty and must be paid for by the purchaser. Electrical Power: Any damage, issues or faults caused by electrical surge or fluctuation. Frequency Interference: Where remote transmitters cannot operate the opener due to frequency interference. Outside of control: Damage due to, but not limited to rain, hail, flood, water, fire or any other event beyond the reasonable control of 4D Doors. Thermal Bowing: Where the door panel will expand, contract or bow due to temperature fluctuations. Consumer Goods: Components such as globes, batteries and other consumable parts are not covered by this warranty. Installation: Faulty installation of the product where the installation is not conducted by 4D Doors or an authorised 4D Doors distributor. Service: A lack of service, care or proper maintenance of the product as decided by 4D Doors. Water Damage: Where water has caused rust, corrosion or other damage. Corrosion: Any damage caused by corrosive conditions including salt and proximity to the sea or any other corrosive environment. Unauthorised acts: Any modifications, repairs or works carried out by anyone who is not authorised by 4D Doors. Other Devices: The fitment of any device to the product which is not approved by 4D Doors. Unreasonable use: If the product is not used correctly or reasonably as deemed by 4D Doors. Instructions: Failure to observe any directions or instructions, including any warning notifications in instruction manuals or signs on or provided with the products. Outside Control: Any events or acts beyond reasonable control of 4D Doors. All products listed within this table are subject to the conditions of this warranty document. The table specifies products and the specific warranty term or number of cycles (whichever occurs first). 4D Doors reserves the right to amend the table and contents including the products, warranty duration and cycles. Please be aware you are responsible for the expense of making a claim under this warranty. To make a claim, please forward a copy of your original receipt as proof of purchase and a completed warranty claim form to 4D Doors directly, if the product was supplied to you directly from 4D Doors. In the case where the products were supplied by an authorised 4D Doors dealer, please provide the copy of your original receipt along with a completed warranty claim form and forward it to that dealer. If the authorised dealer cannot be contacted, then please contact 4D Doors and provide the copy of the receipt and the completed warranty claim form and 4D Doors will forward these to the relevant authorised dealer.